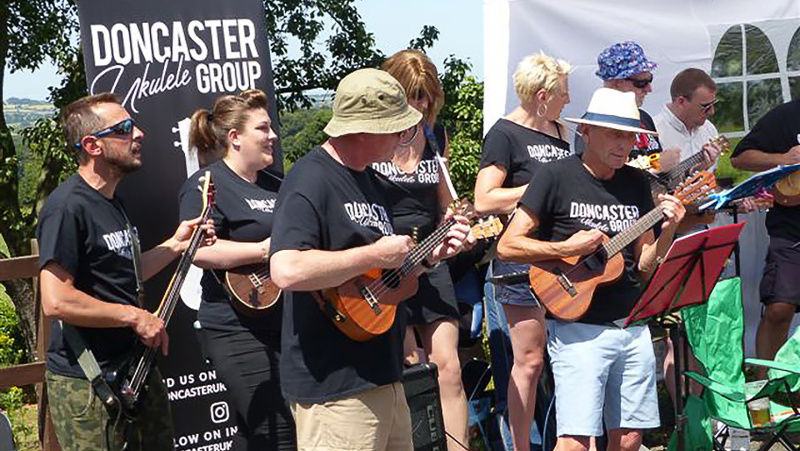 Expert pluckers and average plonkers alike agree there’s endless fun to be had playing the ukulele. And it turns out it’s not all about leaning on lampposts or cleaning windows. Playing ukulele is a widespread activity these days for people of all ages. It’s fun, it’s easy to learn, and best of all it’s never – never – too late to start. Even a touch of deafness, a wheelchair or hand problems like arthritis needn’t stop you enjoying a good old strum as new skills fire up your brain’s creative pathways, and benefits, both physical and mental, start to flow. Small, light, and inexpensive, the ukulele has only four strings, and if soprano size feels too small, a slightly larger concert or tenor size is available. Crucially, unlike the scrapings and shrill shrieks of beginner violin and recorder players, early ukulele chords, some of which need only one or two fingertips on the strings (wahey! ), sound just fine. 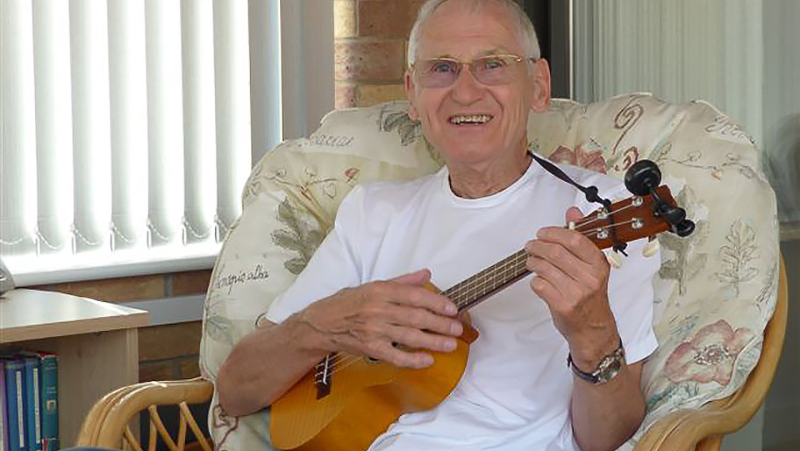 I talked with expert plucker George Hinchliffe, co-founder of The Ukulele Orchestra of Great Britain, admired and revered at sell-out concerts around the world, with Carl Wragg, tutor to players young and old, and Mick Horsfall, an average plonker (his words!) who picked out his first chords at the age of 77 on a cheap, plastic ukulele borrowed from a friend. With just a few basics, Mick got quietly strumming and singing in his conservatory, but he refused point blank to join a group even after wife Jenny bought him his own instrument for Christmas. “I’m not really a group person,” he says. True. Apart from ballroom dancing, quiet, solitary hobbies like dinghy sailing, micro-light flying and making hot-air Stirling engine models are more retired electrician Mick’s cup of tea. How he amazed himself, then, when he did eventually join the town’s ukulele group. Now there’s no holding him back! While wife Jen catches up on box sets, Mick’s out making music amidst the chat and laughter of weekly practice sessions (which then relocate to the pub!) or gigging at Food, Music or Steam Punk Festival in the village hall, field, Mansion House, church, street, theatre or market place. In April, he shared his 80th birthday celebrations – and cakes – with the group, whose members span all ages and all walks of life. It turns out he’s not as unsociable as he thought, and now he has a large motley crew of new friends. Two or three times a week, he also strums away at home – up to 2 hours if the mood takes him. “It’s relaxing. While you’re making music, your mind can’t be on anything else, and concentrating on words and chords forces me to focus my brain. I’m just an average plonker with no real background in music apart from the school choir, and a father who sang in choirs. 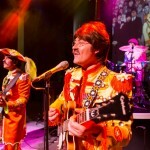 I did borrow a banjo at youth club once and learned a few chords, but when the banjo went back, that was that.” Luckily, Mick got another chance – even if it was sixty-one years later! A deaf ear may mean he misses some of the banter but it doesn’t spoil his enjoyment of the music and the company, and in spite of a crooked little finger and a bit of thumb-strain on some chords, he reckons the flexibility of his fingers has improved since he started playing. “Anyway,” he says, “when stuck – air strum!” One of the beauties of being in a big group is you don’t have to be either an expert player or a great singer. Another challenge for Mick is playing the wide range of songs in the group’s repertoire, not to mention organising them in a fat folder! “I never got into pop,” he says, “so I know very, very few.” The group doesn’t play the Welsh choir hymns or Trad New Orleans jazz that Mick loves, nor even George Formby, but with the aid of YouTube he’s discovering lots of other music he enjoys – maybe not Wonderwall or Space Oddity, but sweet melodies like Country Road and Sweet Caroline or a rousing Bad Moon Rising get a definite thumbs up. 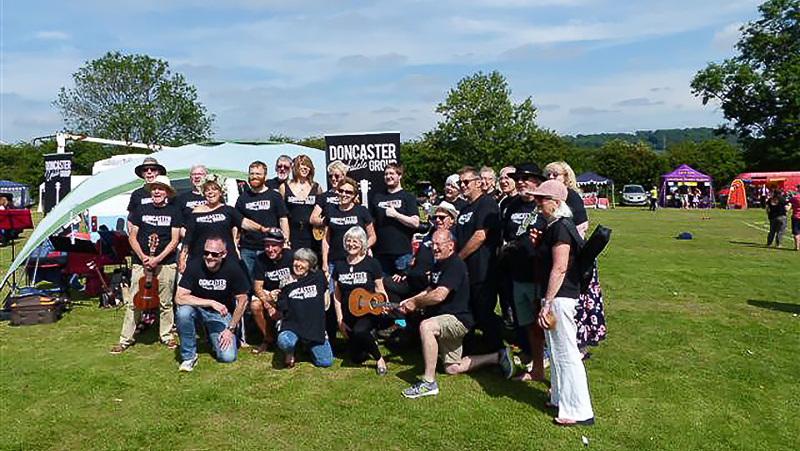 It’s this wide mix of ages and the mutual sharing of favourite music from all decades and genres that tutor/guitarist Carl Wragg finds most enthralling and rewarding, and that makes the group “a feel good place to be.” Older players are open-minded and willing, he says. Even when they don’t fancy a song at all, at least they give it a go (usually) without moaning. Soon they’re happily singing Bruno Mars or The Killers, while younger players fall in love with blasts from the past they’d likewise never heard before. Carl’s certain the uke can be fun for anyone and everyone and is especially easy for guitar players to learn. Another bonus is that subscriptions from his two groups of eager adults help fund the children’s music services. It turns out this group dynamic of shared fun and enjoyment that stimulates and motivates amateur players so much is supremely important, too, to polished professionals. 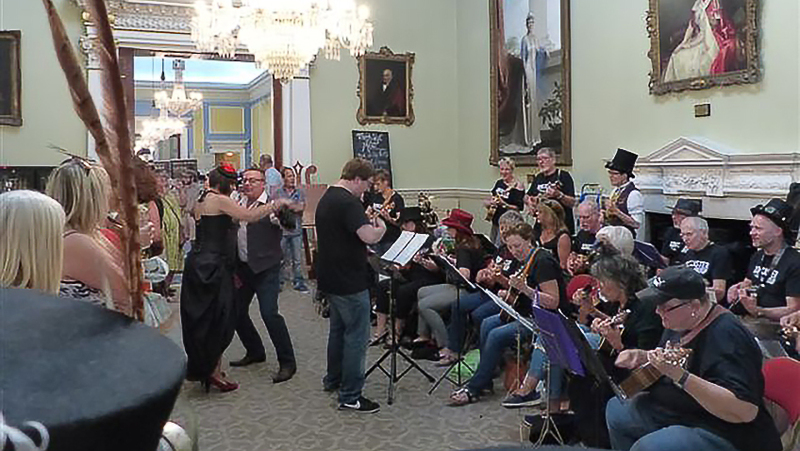 The Ukulele Orchestra of Great Britain started showcasing the stunning capabilities of the humble uke in 1985 as a “wheeze, a caper, a jape.” Ever since, it’s sparked countless thousands the world over to share in their own strum fun. 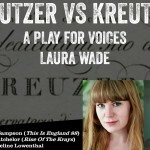 For them, every musical genre is ripe for enthusiastic rip-off, parody or reinterpretation in ingeniously arranged mixes and mismatches of punk, classical, rock ‘n’ roll, folk, bottleneck blues, a capella harmony or championship whistling – plus the occasional serious rendition. 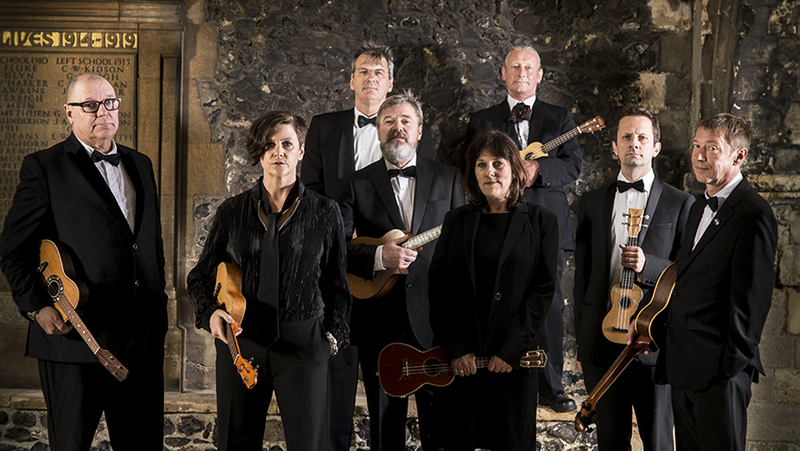 Yet the joy, beauty and ingenious expertise in the music is never lost in the comedy as the ukes ring out and prove they’re second to none. George is sure that enjoying a fun, creative activity, most especially with a group, keeps you alive and alert for longer, lessens problems and helps promote mental and physical wellbeing. Maintaining an interest in life and the world brings a positivity that gets you out of bed each day, while singing and playing together is a great social integrator, too. He recalls how jazz trumpeter and radio host Humphrey Lyttelton worked enthusiastically into his late eighties, claiming the music and routine of touring with younger members are what kept him going and kept him young. Chris Barber is also still active in his late eighties. Octogenarian Mick has certainly got the persistence nailed. When his son says, “Oh, stop it, dad!” he plays on – a great example to all us budding plonkers! 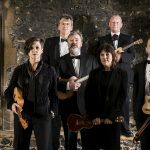 After Germany and Switzerland, The Ukulele Orchestra of Great Britain will be in Chester, Huddersfield, Vienna, Wiltshire, Ilkley, Doncaster, Durham, Birmingham, Worthing, Hastings, Tunbridge Wells, Dartford, Buxton, Basingstoke, Watford, Nottingham, Blackpool, Newcastle-on-Tyne, Southend and Harrogate before touring Germany and the USA in early 2019.